With T-Mobile’s MetroPCS deal now in the books, the company’s CEO is continuing his press rounds today by clearing the air on how the two companies will run side by side. So let’s jump right in and T-Mobile says they will begin selling phones compatible with its network at MetroPCS stores later this quarter. The goal is to have only T-Mobile compatible devices in MetroPCS stores by end of this year according to T-Mobile’s Chief Marketing Officer Mike Sievert. T-Mobile is looking to avoid Sprint’s disastrous move running two networks side-by-side as they attempted after taking over Nextel. Still, the process won’t be quick nor easy and T-Mobile still expects it to take a “couple of years” to make the transition. “The economics suggest it will take some time,” Sievert said. T-Mobile will introduce MetroPCS handsets that run on the T-Mobile’s network as well in the hopes of bringing the MetroPCS brand to new cities. Legere said the company is working on a “double-digit” list of cities, but wouldn’t specify a timeframe for when those markets would launch. Finally, Legere said that T-Mobile is already on track for its goal of shifting the loss of losing postpaid subscriber drops to gaining some customers this year and being full positive in 2014.
i just realized T-Mo has the best logo out of the big 4. i’m glad they didn’t changed it. go T-Mo!!! That doesn’t surprise me, as they will be decommissioning PCS CDMA in 2015 as I recall. I thought their CDMA ran on 1800, no? Good to know. I know 1800 is outdated. Okay, I know frequencies don’t become outdated, but it hasn’t been used in the US by any company for awhile. It’d be great if you would stop downrating my comments. The “1800” band has never been used in the US for cellular. Actually, they’re mainly 1900 (PCS). Hence the name MetroPCS. They started their CDMA network using the PCS band. Why are they transitioning people to Metro? 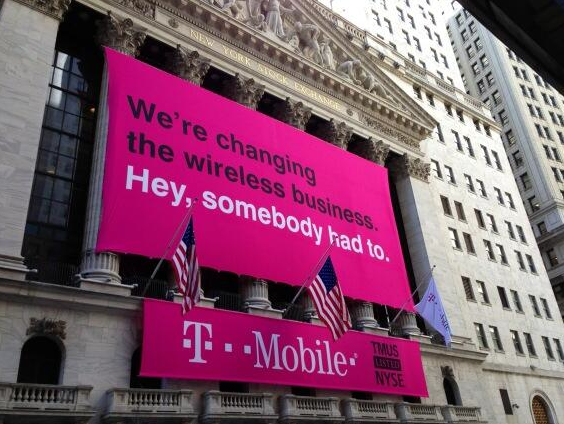 Shouldnt they transition everyone to T-Mo? I think that’s a typo..
not necessarily, spectrum maybe, but towers no, the towers if needed can be used for both pretty easy depending on what kind of radios are on them..
No, for example, in my area MetroPCS had a lot of unused spectrum that they had not assigned yet. At least in this case will likely see an immediate or near immediate improvement once they start using the frequency. Alternatively as they’re seeing less and less people on certain spectrum bands they may be able to breakup up some of the spectrum in order to move it over to HSPA or LTE. Of course this will vary depending on how much spectrum may have, which will determine if they are able to break it up if they have enough. The big question is if I have full access to the T-Mobile network on a Metro PCS plan, wouldn’t that be the better way to go if it’s cheaper? There has to be some kind of differentiation between the cheaper Metro unlimited plans and the T-Mobile ones. Or is it purely branding? Lets get something straight. If you have only 1 or 2 lines than metro PCS is $10 cheaper than T-Mobile. However, if you have 3 lines or more T-Mobile is way cheaper than metro PCS. The only exception is if you are on T-Mobile’s Classic plan which are mostly more expensive than Metro PCS plans. Metro’s PCS discounts $5 for each additional line you add. migration, not network integration.”” This is saying the new company wants T-Mobile customers to go to MetroPCS? When T-Mobile said they were going to introduce MetroPCS devices that were T-Mo friendly, did they mean dual CDMA/GSM phones that can run on both networks or T-Mo phones with the MetroPCS logo on them? T-Mobile freindly. No CDMA devices. Straight talk and WalMart are T-Mobile also. You can choose between AT&T or tmobile when getting straight talk service. Everyone thought (or still thinking) that T-Mobile will keep MetroPCS for the years to come is super far from reality. 3.) MetroPCs will gets rebranded to T-Mobile, I do not expect the name to completely phase out immediately but I am sure MetroPCs clients will start seeing T-Mobile as their provider on their phone screens in the very near future. If tmobile devices will be available on metroPCS, will they be only LTE ones or also HSPA ? If HSPA devices run on metroPCS plans, wouldn’t they compete ? For e.g., for $50/mo, tmobile offers only 500 MB high speed data whereas metroPCS offers 2.5 GB. Will T-Mobile customers get MetroPCS LTE? Someone needs to answer this question now!